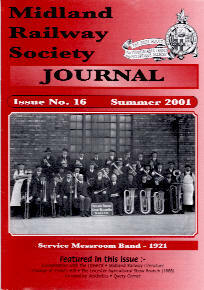 Cover photo: Perhaps this photograph should have appeared in “Query Corner”, for little is known about the Service Messroom Band. It is well recorded that the Midland encouraged its employees to become involved in a variety of extramural activities, and it is quite possible that the company contributed to the cost of the instruments, which was likely to have been beyond the pockets of most conciliation staff. The photograph was probably taken at either the Locomotive or Carriage & Wagon Works at Derby. It is speculation, but could the band have played during the religious services that took place in the Works' messrooms, details of which appeared in Midland Record No.11. Query 22 : Where is this station (1)? Query 23 : Where is this station (2)? Query 24 (new query) : Unknown Midland Railway saloon near Wimbourne S&DJR. Query 26 (new query) : Where was this photograph taken? 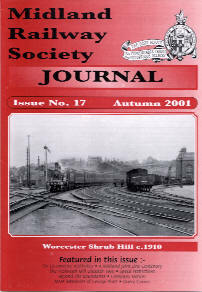 Back cover: From 21st January to 1st February 1892 trains could not run via the Worcester Loop between Stoke Works and Abbott’s Wood Junction, due to an obstruction in Worcester Tunnel. 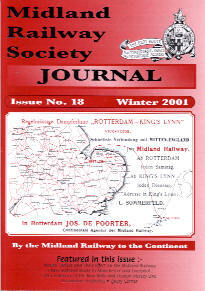 Notices were published which showed trains being diverted via Spetchley and Dunhampstead, with some services serving Worcester from Abbott’s Wood worked by pilot locomotives. Illustrated here is part of a circular which regularised the arrangements from 24th January. More information about the arrangements can be found under “Comment”.